With a run of four home games in five, Dan Micciche hopes to get off to a flying start against Bristol Rovers this Saturday. 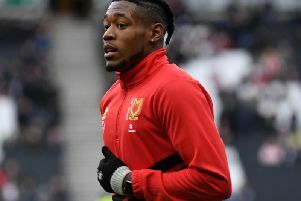 Still without a win as MK Dons boss, Micciche could have Osman Sow back in his squad ahead of the visit of Rovers, who sit comfortably midtable in League 1. Saturday’s opponents Bristol Rovers were 2-0 winners when the sides met earlier this season at the Memorial Stadium. Of the 11 previous meetings though, Dons have won six times, with Rovers triumphing just twice. Dons’ last win over the Gas came in February 2011 with a 2-1 win. Having drawn their last two, Micciche believes if Dons can reproduce their recent performances against Darrell Clarke's side, they will come out on top. "They deserve our respect," said Micciche. "They're midtable, they have a style of play that we're aware of, we know what their threats are but I also know how to cause them problems. "We're at home, we're MK Dons, we've got good players and if we can take the game to them and put in a performance like we have in recent weeks, I think we'll be fine." "We're really looking forward to being home, on a good pitch in front of our crowd. We're aware of how many home games we have in the month coming up and it's important we pick up maximum points. We all know away games are tough, especially midweek, but now we're at home I'm really confident." Injuries have blighted Dons' squad of late, but with the return of Chuks Aneke last week, Micciche hopes to have Sow and potentially Peter Pawlett back this weekend. "Osman has trained with us this week and will be involved on Saturday in one way, shape or form. Peter we're still monitoring, so I can't say at the moment for sure whether he'll be available or not. "Injuries are part and parcel of football, but we've been unlucky in the attacking areas. It's not like it has been across the pitch. Marcus Tavernier, Peter Pawlett, Osman Sow, Chuks Aneke so we've lost players in that attacking third. I'm looking forward to having them all back on the pitch." Snow across the country has caused havoc, not least for Dons as they tried to train ahead of the game, which Ed Upson, returning from suspension this weekend, is desperate to see go ahead. He said: "As long as it stops snowing, it's minus five out there, I think we should be OK to get the game on. "It's not been too bad for us in training, we've been on the astro-turf near the train station and getting good work in up there. The conditions are difficult, but we're putting hte work in and hopefully we can get on some grass before the weekend. "